Easily connect defibrillators to your pacemaker programmer. We understand how important it is that you be prepared to slave from a number of devices. Supplement your purchase with the ME550Z: this unique adapter enables connection between your programmer cable and the Zoll M.
for connection to nearly every defibrillator you may encounter. 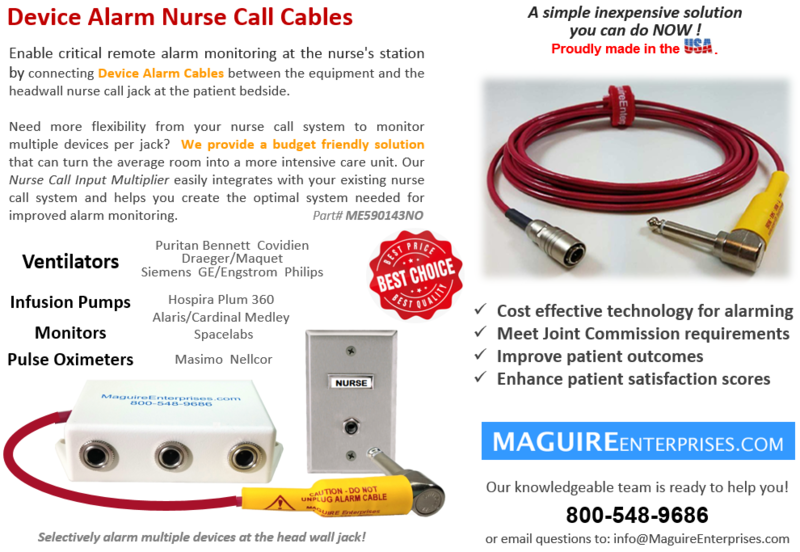 Trust MAGUIRE products to make your work in Cardiac Rhythm Management easier! *Item ME550Z is not shown on our website – please call us at (800)548-9686 for more information regarding this product. Our professionally designed interconnect cables, adapters and extensions help you create the optimal system needed for improved physiologic monitoring. 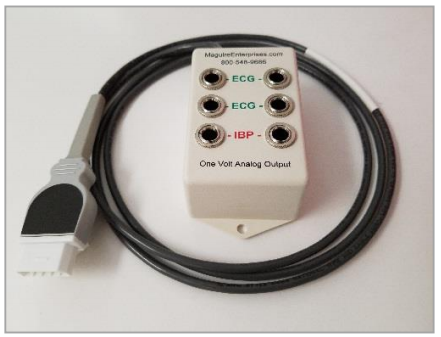 When used with our output multiplier, these products can reduce the number of patient cables needed to monitor on all devices. Let our knowledgeable team help you create a tailored solution that is specific to your equipment configuration and goals. This unique line of products serves to expand the anesthesia monitor’s single analog output. The result is a simultaneous connection to multiple critical devices, such as the defibrillator, balloon pump, ultrasound, and other physiologic monitoring equipment needed in the cardiovascular operating room. Viewing ECG and IBP waveforms on these critical devices without adding multiple sets of patient leads not only reduces cable clutter, it ensures that each device is looking at the same physiologic signal. Hundreds of top rated hospitals consider this method of interconnect to be efficient and desirable! Use the info-graph below to select the output multiplier and ancillary slave cables needed to bring these benefits to your facility. 3) Select IBP interconnect cables for connection to peripheral devices (balloon pump and CCO – continous cardiac output monitor). ME590265P: Bifurcated cables meet at a small junction box that combines them into one 14 foot cable run for high level ECG and IBP from this output to the auxiliary inputs of a balloon pump. Both ends of the cable are identical. ME590338J: Balloon Pump, Cable, IBP signal only. The ability to interconnect a physiologic monitor to additional monitoring devices is often an important consideration for the buyer. 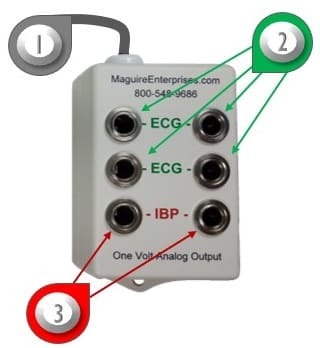 Let MAGUIRE help you and your customer with necessary ECG & IBP slave cable connections, along with unique multipliers and adapters that support required interoperability! slaved ECG & IBP connections. to 4 ECG and 2 Blood pressure waveforms. We’ve worked with thousands, providing Interconnect Solutions that work with specific equipment arrangements. Your request is likely our in-stock solution. CALL and speak to our knowledgeable team or EMAIL us your project details today!